Welcome to Thoroughbred Daily News (“TDN”)! We will refer to TDN as the “Service”. We (that is TDN and its other business groups and affiliates) will provide the Service to you, subject to the following terms and conditions – referred to as the “Service Agreement” or “SA”, which may be updated or modified by us from time to time without notice to you, therefore you need to regularly check this agreement to stay up to date. You can review the most current version of the SA at any time at www.thoroughbreddailynews.com. Your use of the Service will confirm our agreement to these terms and conditions as well as your acceptance of the changes we make to the SA. Consequently, PLEASE READ THIS SERVICE AGREEMENT CAREFULLY BEFORE ACCESSING OR USING TDN. BY ACCESSING OR USING TDN, YOU AGREE TO BE BOUND BY THESE TERMS AND CONDITIONS. IF YOU DO NOT WISH TO BE BOUND BY THESE TERMS AND CONDITIONS, YOU MAY NOT ACCESS OR USE TDN. REMEMBER THAT TDN MAY MODIFY THIS AGREEMENT AT ANY TIME, AND SUCH MODIFICATIONS SHALL BE EFFECTIVE IMMEDIATELY UPON POSTING OF THE MODIFIED AGREEMENT. YOU AGREE TO REVIEW THE AGREEMENT PERIODICALLY TO BE AWARE OF SUCH MODIFICATIONS AND YOUR CONTINUED ACCESS OR USE OF TDN SHALL BE DEEMED YOUR CONCLUSIVE ACCEPTANCE OF THE MODIFIED AGREEMENT. 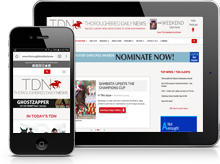 TDN is an online directory service of thoroughbred-industry information. Unless explicitly stated otherwise, any new features that augment or enhance the current Service shall be subject to the SA. You understand and agree that the Service is provided “AS IS” and that we do not assume responsibility for the timeliness, deletion, mis-delivery or failure to store any user provided content, communications, or personalization settings. Use of the Service may require you to register and obtain a password. In return for our enabling you to use the Service, you agree to: (a) provide true, accurate, current and complete information about yourself when necessary or as prompted by the Service’s registration form (such information being the “Registration Data”) and (b) maintain and promptly update the Registration Data to keep it true, accurate, current and complete. If you provide any information that is untrue, inaccurate, not current or incomplete, or we have reasonable grounds to suspect that such information is untrue, inaccurate, not current or incomplete, we have the right to suspend or terminate your account and refuse any and all current or future use of the Service (or any portion thereof). When the particular service you use requires you to register as described above, you will also receive a password and account designation upon completing the Service’s registration process. You are responsible for maintaining the confidentiality of the password and account, and are fully responsible for all activities that occur under your password or account. You agree to (a) immediately notify TDN of any unauthorized use of your password or account or any other breach of security, and (b) ensure that you exit from your account at the end of each session. TDN cannot and will not be liable for any loss or damage arising from your failure to comply with this Section. (a) TDN reserves the right to deny access to you or any group of users to the Service, at its sole discretion, at any time. TDN also reserves the right to remove any listings or other information or Content from the Service at any time and at its sole discretion. (b) TDN cannot and does not guarantee or warrant that files available for downloading through the Service will be free of infection or viruses, worms, Trojan horses or other code that manifest contaminating or destructive properties. You are responsible for implementing sufficient procedures and checkpoints to satisfy your particular requirements for accuracy of data input and output, and for maintaining a means external to the Service for the reconstruction of any lost data. (c) TDN DOES NOT MAKE ANY EXPRESS OR IMPLIED WARRANTIES, REPRESENTATIONS OR ENDORSEMENTS WHATSOEVER (INCLUDING WITHOUT LIMITATION WARRANTIES OF TITLE OR NONINFRINGEMENT, OR THE IMPLIED WARRANTIES OF MERCHANTABILITY OR FITNESS FOR A PARTICULAR PURPOSE) WITH REGARD TO THE SERVICE, ANY MERCHANDISE, INFORMATION OR SERVICE PROVIDED THROUGH THE SERVICE, OR ANY MERCHANTS LISTED ON THE SERVICE, AND TDN SHALL NOT BE LIABLE FOR ANY COST OR DAMAGE ARISING EITHER DIRECTLY OR INDIRECTLY FROM ANY SUCH TRANSACTION. TDN DOES NOT WARRANT THAT THE SERVICE WILL BE UNINTERRUPTED OR ERROR-FREE OR THAT DEFECTS IN THE SERVICE WILL BE CORRECTED. THE SERVICE IS PROVIDED ON AN “AS IS, AS AVAILABLE” BASIS. IN NO EVENT WILL TDN (OR ITS DIRECTORS, OFFICERS, EMPLOYEES, SUPPLIERS, AGENTS, REPRESENTATIVES, DISTRIBUTORS OR AFFILIATES) BE LIABLE FOR (I) ANY INCIDENTAL, CONSEQUENTIAL, INDIRECT OR SPECIAL DAMAGES (INCLUDING, BUT NOT LIMITED TO, DAMAGES FOR LOSS OF PROFITS, BUSINESS INTERRUPTION, LOSS OF PROGRAMS OR INFORMATION, AND THE LIKE) ARISING OUT OF THE USE OF OR INABILITY TO USE THE SERVICE, OR ANY INFORMATION, OR TRANSACTIONS PROVIDED ON THE SERVICE OR DOWNLOADED FROM THE SERVICE, EVEN IF TDN OR ITS AUTHORIZED REPRESENTATIVES HAVE BEEN ADVISED OF THE POSSIBILITY OF SUCH DAMAGES, OR (II) ANY CLAIM ATTRIBUTABLE TO ERRORS, OMISSIONS, OR OTHER INACCURACIES IN THE SERVICE, INCLUDING WITHOUT LIMITATION ANY DIRECTORY OR EVENT LISTINGS OR INFORMATION DOWNLOADED THROUGH THE SERVICE. BECAUSE SOME STATES DO NOT ALLOW THE EXCLUSION OR LIMITATION OF LIABILITY FOR CONSEQUENTIAL OR INCIDENTAL DAMAGES, THE ABOVE LIMITATION MAY NOT APPLY TO YOU. IN SUCH STATES, TDN’S LIABILITY IS LIMITED TO THE GREATEST EXTENT PERMITTED BY LAW. TDN reserves the right at any time and from time to time to modify or discontinue, temporarily or permanently, the Service (or any part thereof) with or without notice. You agree that TDN shall not be liable to you or to any third party for any modification, suspension or discontinuance of the Service. You agree that TDN, in its sole discretion, may terminate your password, account (or any part thereof) or use of the Service, and remove and discard any Content within the Service, for any reason, including, without limitation, for lack of use or if TDN believes that you have violated or acted inconsistently with the letter or spirit of the SA. TDN may also in its sole discretion and at any time discontinue providing the Service, or any part thereof, with or without notice. You agree that any termination of your access to the Service under any provision of this SA may be effected without prior notice, and acknowledge and agree that TDN may immediately deactivate or delete your account and all related information and files in your account and/or bar any further access to such files or the Service. Further, you agree that TDN shall not be liable to you or any third party for any termination of your access to the Service. You acknowledge and agree that the Service and any necessary software used in connection with the Service (“Software”) contain proprietary and confidential information that is protected by applicable intellectual property and other laws. You further acknowledge and agree that Content contained in information presented to you through the Service is confidential non-public information. Except as expressly authorized by TDN, you agree not to modify, rent, lease, loan, sell, distribute or create derivative works based on the Service, the Software or the Content, in whole or in part. With regards to French racing video, you are prohibited from directly or indirectly durably storing, reproducing, representing or keeping all or a substantial qualitative or quantitative part of the Video Archive Services of PMU’s INFOCENTRA (the “DATA”) on any medium of any kind (paper, electronic, graphic medium or any other medium which may be invented) by any means and in any form whatsoever. You undertake not to transmit or disclose the DATA either free of charge or for valuable consideration, to any third party. The compilation of the Content is copyrighted under the United States copyright laws. The owner of the copyright is TDN. TDN grants you a personal, non-transferable, non-sublicenseable, and non-exclusive right and license to print and download portions of the Content or other information found on the Service solely for your own non-commercial use. Any other copying, redistribution, retransmission, display or publication of any downloaded information is strictly prohibited without the express written consent of TDN. Any cause of action or claim you may have with respect to the Service must be commenced within one year after the claim or cause of action arises or such claim or cause of action is barred. ALL DISPUTES, CONTROVERSIES OR CLAIMS, WHETHER BASED IN CONTRACT, TORT, STATUTE, FRAUD, MISREPRESENTATION OR ANY OTHER LEGAL THEORY, ARISING OUT OF OR RELATING TO THIS AGREEMENT AND THE SERVICE (“DISPUTES”) SHALL BE SETTLED BY FINAL AND BINDING ARBITRATION CONDUCTED IN MONMOUTH COUNTY, NEW JERSEY, BY A NEUTRAL ARBITRATOR, IN ACCORDANCE WITH THIS AGREEMENT AND THE THEN CURRENT COMMERCIAL ARBITRATION RULES OF THE AMERICAN ARBITRATION ASSOCIATION. The arbitrability of Disputes shall also be determined by the arbitrator. Each party shall bear its own expenses, except that the prevailing party may recover the filing costs and the expenses of the arbitrator from the other party. Any award of the arbitrator shall be in writing and shall state the reasons for the award. Judgment upon an award may be entered in any Court having competent jurisdiction. The arbitrator shall not have the power to order pre-hearing discovery of documents or the taking of depositions, but may compel attendance of witnesses and the production of documents at the hearing. The Federal Arbitration Act, 9 U.S.C. Sections 1 to 14, shall govern the interpretation and enforcement of this paragraph. The foregoing notwithstanding, this agreement shall not prevent the parties from seeking and obtaining temporary equitable remedies, including temporary restraining orders, from a court with jurisdiction over the parties and the subject matter. A request to a court for interim equitable relief shall not be deemed a waiver of the obligation to arbitrate. TDN is a trademark and/or service marks of MediaVista, Inc. Other TDN products, services and company names mentioned herein and or applicable Company Web sites may be the trademarks and/or service works of TDN. This Agreement shall all be governed and construed in accordance with the laws of the State of New Jersey applicable to agreements made and to be performed in New Jersey. Information as to races, race results and earnings was obtained from result charts, Copyright (C) 2015, Daily Racing Form, Inc., All Rights Reserved, published in the Daily Racing Form and utilized herein with permission of the copyright owner. While the information contained herein is believed to be accurate, Bloodstock Research Information Services, who provides information to TDN, will not be responsible for any error. No part of this work covered by this copyright may be reproduced in any form or by any means without written permission of the Daily Racing Form, Bloodstock Research Information Systems, or Thoroughbred Daily News. The above copyright and disclaimer applies to any inquiry run during any session on ThoroughbredDailyNews.com, or to any information retrieved from our World Wide Web Site now or in the future. No part of this inquiry may be reproduced in any form or by any means without written permission of Bloodstock Research Information Services, Inc. or Thoroughbred Daily News.